This is a farther dated option strategy than most but the option volatility is good here. First let’s look at an Iron Condor near 30 Deltas. Our max profit is 41 which is good for a 30 Delta. 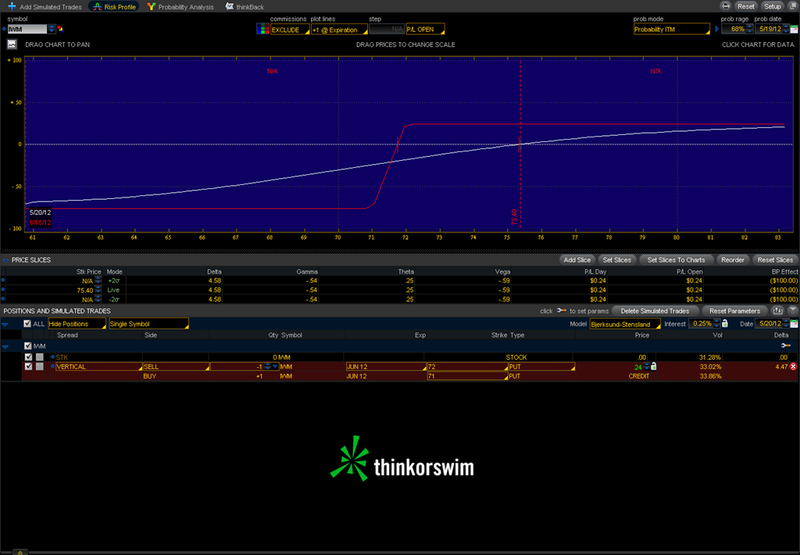 The Strangle provides 1.61 Credit per spread, compared to the .41 per spread for the Iron Condor. This position is Theta positive, but the decay will not affect the position that much for a few weeks. The Strangle provides us with a wide area to profit in. The margin requirement will be higher since these are uncovered options. The advantage is that it takes fewer Strangle give a good credit when compared to the Iron Condor. The P&L curve is also more forgiving as the edges are approached. 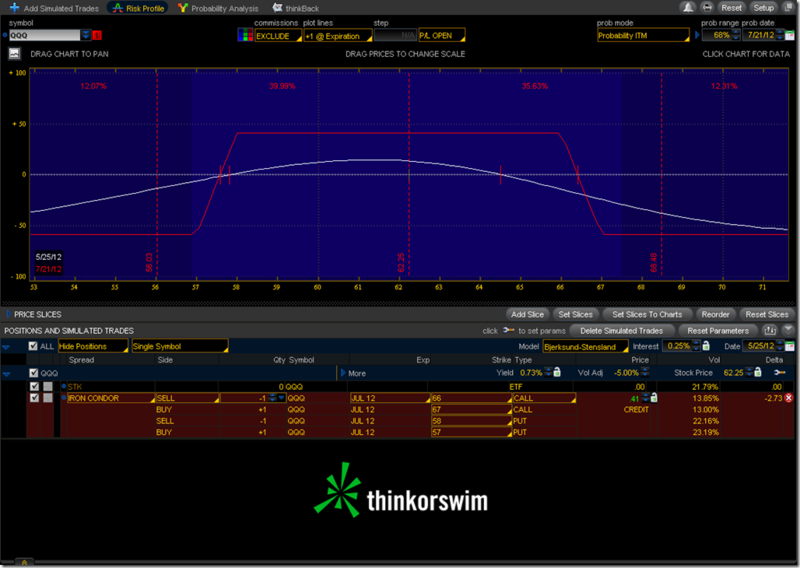 This position will benefit over time, but a reduction in volatility will produce results even faster. If Volatility drops by 5% we can see from the simulation that almost 50% of the max gain can be realized if the price remains close to where it is today. Since the position is slightly Delta positive there can also be a little upside before the gains begin to drop off. If the position moves too much then it is possible to roll both strikes to cover the new range. 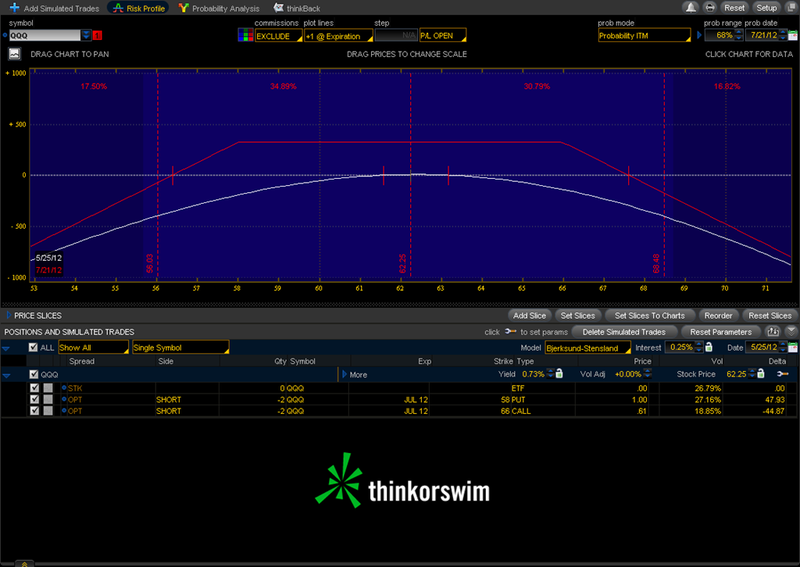 The Strangle can be an effective alternative to the Iron Condor if your trading size is reduced and if you have the margin available. 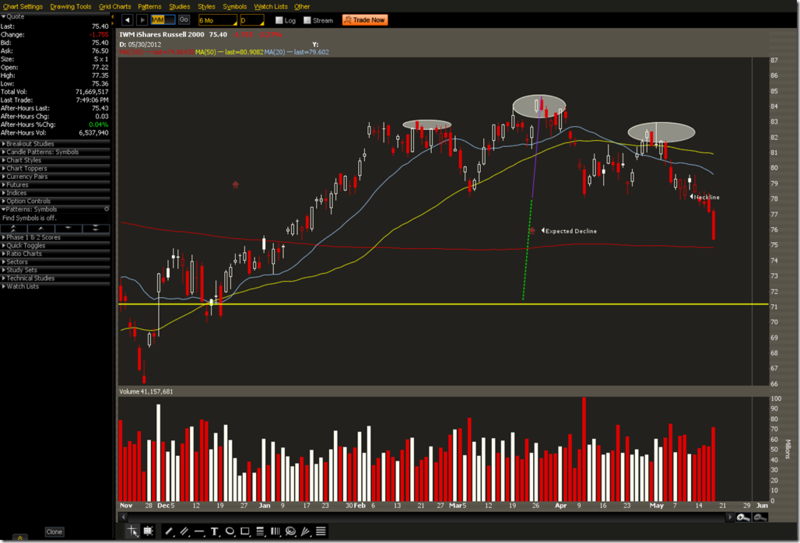 IWM has fallen below the neck line of a head & shoulders pattern. We took action on May 4 to hedge risk by moving into a 76 Put Calendar after seeing the beginning of a H&S pattern. The 20MA was under the 50MA which lead us to believe there would be continued weakness. 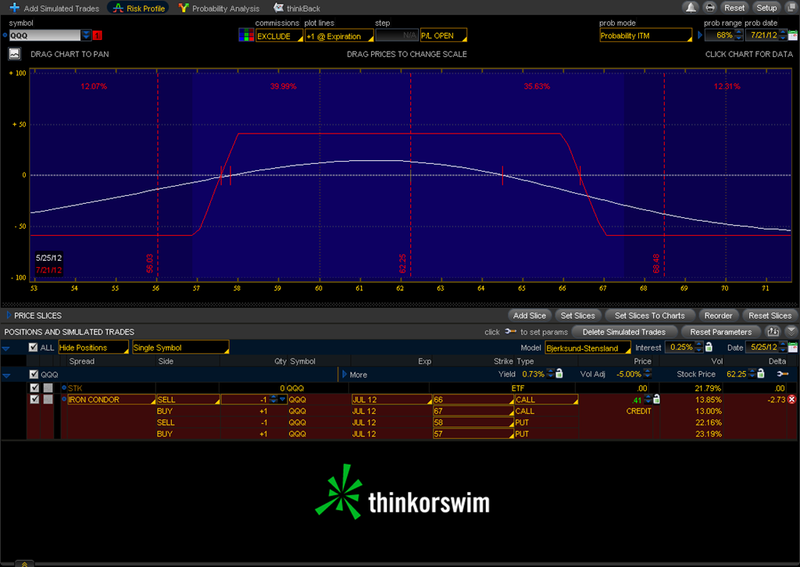 This position benefitted from the increase in volatility (RVX) over the past few days. We traded through the max profit point one day before expiration which meant the position worked perfectly. 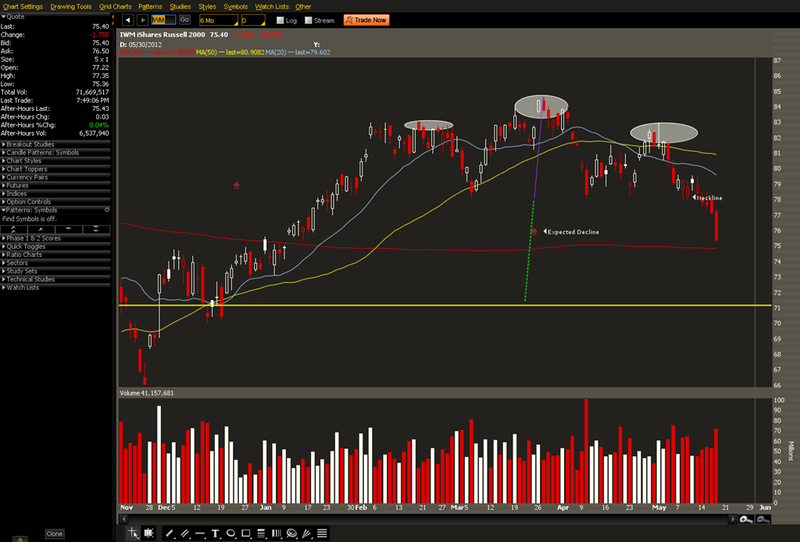 The measured move from the head to the neckline places IWM around the 71 level. There is also some prior support close to there. There could be a small bounce at the 200MA, but if news out of Europe continues to be uncertain this could end up being a textbook H&S pattern. 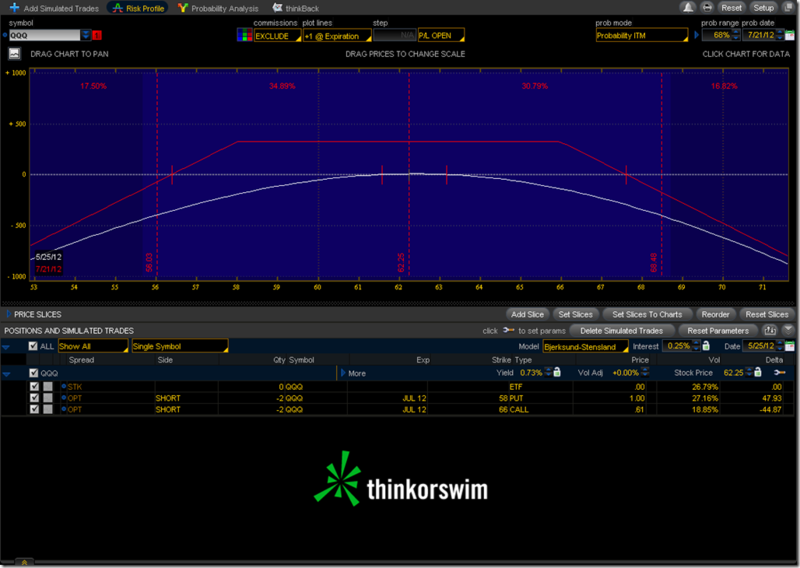 If there is a continued downside move, buying more PUT calendars here could be a good choice. Buying a June PUT and selling a May Weekly PUT against it could offer several opportunities to roll the calendar or switch it to a diagonal. A double calendar gives a large area to salvage the trade in a one week period, but it reduces the reward.